The Giro d’Italia starts on Saturday. It often passes without much comment in the UK because unlike the other two Grand Tours it isn’t shown on terrestrial TV. It’s a good race though. Worth following. Last year’s winner, Nairo Quintana, is busying himself with the Tour de France this year and so won’t be taking part, so here’s a quick rundown of the various team leaders together with a vague comment about their respective chances. His reputation has diminished a tad in recent years, but Contador still wins Grand Tours more often than not, which is a sobering thought. The only contemporary rider brassy enough to try and go for the Giro and the Tour in the same year, he’ll doubtless be less fit but more fresh for this race and more fit but less fresh for the Tour. Roman Kreuziger’s another worth watching from this team. The Tasmanian appears to be second favourite with the bookmakers. He’s won three stage races this year, but it’s worth noting that his best Grand Tour finish remains seventh in the 2010 Giro. He’s a match for anyone on any given day, but somehow over three weeks, he always seems to fall ill or something. You can say his luck is bound to change, but maybe his body just doesn’t suit a Grand Tour. His support acts include King Leopold (Leopold Konig) who has two Grand Tour top ten finishes out of two in his short career. Second last year. People say he’s a climber because he’s Colombian, but he ain’t. I mean obviously he’s good going uphill, but it’s not really a specialty. He always seems the archetypal podium finisher to me, but a couple of crashes for others and maybe that could change. Yes! In short, my favourite rider. To make matters even more hilarious, he also has support from Carlos Betancur, a man who can win Paris-Nice and finish second-to-last in the Vuelta in the same year. Phil Gilbert’s leading BMC and so they’re presumably not even thinking about winning overall – he’ll be trying to win stages. 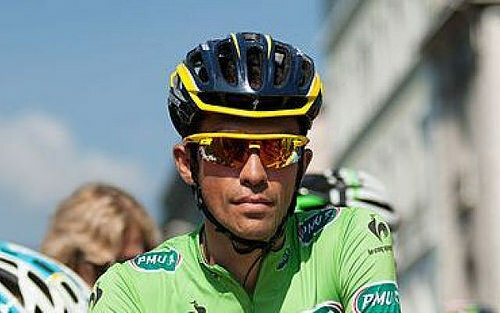 Same for Sylvain Chavanel for IAM Cycling and Michael Matthews of Orica – GreenEDGE. I’d probably say the same again for Diego Ulissi of Lampre – Merida as well. Back from a too-many-puffs-on-his-inhaler ban, he’s a strong finisher who actually managed to stay inside the top ten for the first ten stages last year (perhaps it was the Ventolin). Benat Intxausti’s the Movistar rider who isn’t Nairo Quintana or Alejandro Valverde, but he did manage to finish eighth last year. Damiano Cunego’s a rider whose best years have always seemed suspiciously hard to repeat, but he does seem to be riding okay this year. Ryder Hesjedal of Cannondale – Garmin has actually won this race, which seems weird. Who knows how he’ll go. Finally, Jurgen Van Den Broeck of Lotto – Soudal is surely a shoo-in for ninth place overall – although you might never actually catch sight of him at any point.